UFC president Dana White has made no bones about his dislike for Paul Daley and his sucker-punching ways. Since the welterweight has been permanently blacklisted from the Octagon, the Brit has been left with no choice but to return the disdain. 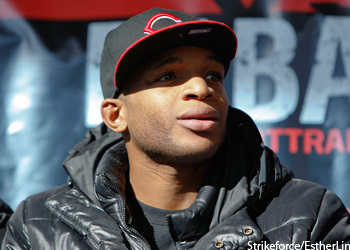 Although Daley has an April 9th title fight scheduled against reigning Strikeforce welterweight champ Nick Diaz, the controversial slugger is threatening to bail from the scrap after the UFC’s monumental purchase of their stateside rivals on Saturday. “Business as usual, what if i dont wanna fight for DANA WHITE/ZUFFA?……Dana white bans me for life from the UFC, Then buys STRIKEFORCE, and thinks im still gonna be EASY and fight on one of the most anticipated fights of the year (vs Diaz)? Which will no doubt make ZUFFA/Dana White money. “Semtex” owns an impressive 27-9-2 MMA record, but was punted from the world’s premier mixed martial arts promotion after his cheap shot on Josh Koscheck at UFC 113 in May 2010. He’s rattled off four consecutive wins since his dismissal. “Strikeforce: Diaz vs. Daley” is scheduled to take place inside the Valley View Casino Center in San Diego, California. Showtime will broadcast the star-studded event.